Senator John McCain died yesterday, at age 81, after a long battle with brain cancer. He was an American hero for his fierce resistance to his North Vietnamese captors after he became a prisoner during the Vietnam War, and after he was released from captivity he forged a long and equally independent record in Congress. He was a proponent of campaign finance reform, a steadfast supporter of veterans, and a strong advocate for the military. McCain was one of those members of Congress who was willing to buck party leadership and reach across the aisle if he felt it was the right thing to do — a reputation that was confirmed when he voted against a repeal of Obamacare — and if I didn’t always agree with his positions, I always felt that he was largely motivated by a sincere belief in what would be best for the country. It’s an impressive legacy — but for many people, McCain will be remembered primarily as the man who was beaten by Barack Obama in the 2008 presidential election. McCain’s death got me to thinking about the people who have run for President on a major party ticket in a general election and lost, and how many of them are still living. Two of the oldest members of that group, Jimmy Carter and George H.W. Bush, actually won the presidency before losing their bids for re-election. The other living members of the club of people who were unsuccessful in their run for the presidency include Mike Dukakis, Bob Dole, Al Gore, John Kerry, Mitt Romney, and Hillary Clinton. All of them have had successful careers in politics and have made different contributions to the country — and all of them will be remembered, at least in part, for the time they lost. America is a tough place for a politician. The higher they rise, the higher the stakes, and when a person raises the money and makes the speeches and personal appearances and survives the primary system and becomes the nominee of a major political party, the stakes are the highest of all. We routinely honor the winners — at least, most of them, if only for a short period of time — and second-guess and chastise the losers, dissecting their campaigns and pointing out every flaw and flub. John McCain shows how unfair that perception is. Sure, he never became POTUS, but that fact doesn’t detract from who he was or what he accomplished. He was a lot more than an also-ran. I’m guessing that what happened is this: some political operative issued “talking points” that strongly discouraged using the word “war” because they don’t want Americans to think they’re going to see a repeat of the Afghanistan and Iraq campaigns. But if you say you are going to destroy an an armed opponent, as President Obama said of ISIS in his speech this week, what you are talking about obviously is a war. Quibbling about words makes the Secretary of State and National Security Advisor look like political flacks rather than the thoughtful, above-the-fray stewards of American foreign policy. This is another instance, too, where the words can have real-world consequences. America is trying to build a coalition of countries to fight ISIS. If you are the leader of one of those countries that is considering joining the coalition, and you are trying to decide whether you can trust the United States, what message about long-term American commitment do you draw from the silly wrangling about whether the U.S. actions are a “war” or a “major counterterrorism operation”? If you’re trying to decide whether to deploy your scarce military and economic resources, and potentially make your country a target of a brutal group of Islamic terrorists, do you want to rely on an ally that is inexplicably pussyfooting around about whether it is fighting a “war”? Tonight President Obama will give a nationally televised address about the Islamic State in Iraq and Syria, the group of murderous terrorists who have seized territory in those countries and intend to establish their own nation. It’s an important speech for the President, and for our country. It’s important for the President because he desperately needs to reestablish his credibility in the area of foreign affairs. He has been dogged by ill-advised comments, like the one describing ISIS as a kind of “junior varsity” squad, that paint him as possessing a curious mixture of overconfidence, naivete, and ignorance about history and human motivation. The President seems to believe that an inevitable historical arc will move us toward a world of eternal peace, diversity, and right-thinking people who inevitably will adopt every democratic liberal precept — without realizing that there are fanatics, like those who make up ISIS and Boko Haram, that are dead set on establishing an historical arc that bends in precisely the opposite direction. In the past, President Obama has been unwilling to admit that he’s made mistakes, but if the brutality of ISIS at least causes him to shed his rose-colored glasses about the dangerous world outside our borders that’s a step in the right direction. As for the country, it’s important that we recognize that ISIS is a different, and immensely significant, threat. Unlike itinerant terrorist groups like al Qaeda that move from place to place depending on local conditions and shifting political winds, ISIS intends to establish a nation. It has captured funds and an arsenal of weapons from Iraq and seeks to control oil wells and oil refineries that would provide long-term, ongoing funding for its terrorist aims. There is an additional dangerous element to ISIS. Any group that would videotape and publicize its beheading of innocent journalists obviously doesn’t subscribe to accepted social norms, and ISIS’ treatment of civilians and captured soldiers in Syria and Iraq further speak to its utter brutality and depravity. ISIS actively seeks to recruit like-minded jihadists from countries across the globe, including the United States and Great Britain, and it’s not shy about describing its intention to take the jihadist fight to our homeland. We should take them at their word. No one should doubt that ISIS poses a grave threat to America, and if we don’t act to punish and defeat them the threat will only grow more severe. According to the Washington Post, tonight the President will announce a plan to launch airstrikes against ISIS in Syria, and Secretary of State John Kerry is in the Middle East building support for broader action against ISIS. This seems like a mirror image of the situation before the first Gulf War, when the actions of a rogue state threatened to destabilize an entire region and spread chaos on a much wider scale. It’s time for the United States to form and lead a coalition, again, to defeat the latest rabid threat to the world to spring from ever-fertile grounds of the Middle East. 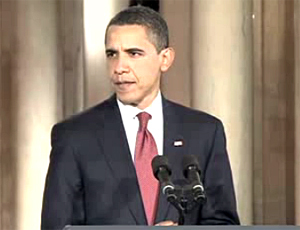 If President Obama is willing to accept that responsibility, I support him. I don’t think we have any choice. On Tuesday U.S. Secretary of State John Kerry, who is in the Middle East trying to arrange for a cease-fire in the Israeli-Palestinian fighting in Gaza, met with the Egyptian President. Prior to the meeting, Kerry’s aides had to go through a metal detector, and Kerry himself was scanned with a security wand. Reuters reports that such a security screening of a high-ranking U.S. official is “unusual.” I’d say it’s unprecedented. I cannot remember any instance where the American Secretary of State was screened, or wanded down, prior to meeting with a foreign dignitary. And, it’s hard not to feel a certain sense of schadenfreude at seeing a guy who is usually ushered from meeting to meeting by limo and subject to elaborate courtesies have to undergo a security scan like the rest of the masses. Obviously, though, there’s a more important issue at work here. We know the Middle East is a place where symbolism is important and people are deeply sensitive to perceived slights; showing the sole of your shoe can be viewed as a deadly insult. I’m confident that the security screening was an intentional effort to send a message; no one could reasonably believe that the Secretary of State was packing heat or posed a security threat. The message therefore has to be that the Egyptian government doesn’t view representatives of the American government as needing special treatment, and they wanted Kerry and his aides to understand that new reality in a very tangible, personal way. With the incident being widely reported, and with the groupthink mentality at play in the Middle East, the Egyptian view may well be shared by other governments in the region, too. If American diplomats are treated like security threats by governments in countries that we hope will help to keep the peace in that deeply troubled region and American power and influence in the Middle East in fact is waning, it is bad news for America and bad news for the world. Diplomats are expected to be careful and judicious in their speech — which is why the word “diplomatic” found its way into everyday speech — but U.S. Secretary of State John Kerry is the exception to the rule. He seemingly has a knack for ill-advised comments. What’s interesting about the story is not Kerry’s blunder — we should all be used to that by now — but that it happened at a super-secret, closed-door meeting of the Trilateral Commission. For decades, the Trilateral Commission has been a favorite target of conspiracy theorists, who have depicted is as a kind of shadow world government that puts people into positions of power and then pulls the strings. So, how did someone get a recording of a powerful figure speaking to the Commission? 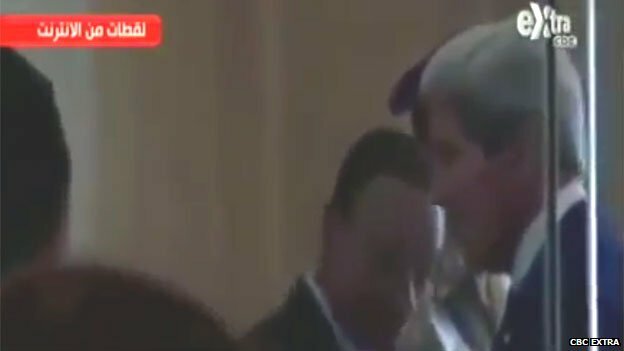 It turns out that a journalist just walked into the meeting — he “slipped past both Commission staff and Diplomatic Security,” according to a letter of apology the North American chair of the Commission wrote to Kerry — and recorded Kerry’s remarks. The incident therefore doesn’t reflect the kind of approach to security you’d expect from the hyper-competent, brooding omnipresence depicted by the conspiracy-minded. So, perhaps John Kerry’s latest bit of thoughtless floundering may have a positive impact after all: it may finally strike the Trilateral Commission from the list of organizations that are the focus of international intrigue and the latest conspiracy theories. Today the United States and a group of other countries reached agreement on a proposal that addressed the Iranian nuclear program. The agreement is a temporary one, apparently designed to freeze the Iranian program in place so that additional negotiations can occur. According to the BBC, the key elements of the agreement are that Iran will stop enriching uranium beyond a certain point, allow inspectors increased access to its nuclear sites, and stop development of a plant that could create plutonium, and in exchange no new sanctions will be imposed for six months and Iran will receive billions of dollars in relief from existing sanctions. U.S. Secretary of State John Kerry says the deal gives the U.S., and Israel, “breathing space” for additional negotiations with Iran. 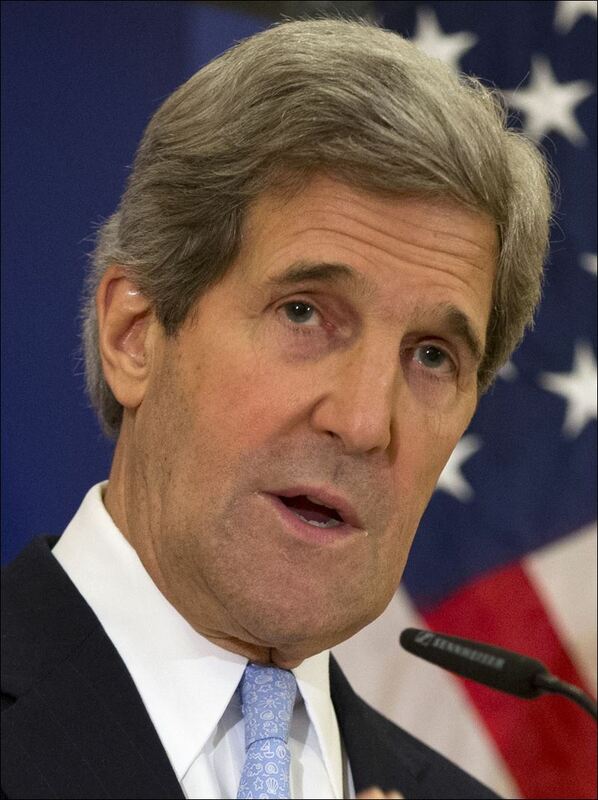 Iran says the deal recognizes its right to enrich uranium; Kerry denies that. Is it a good deal? I tend to trust Israel on Middle Eastern matters, because the Israelis have shown a very clear-eyed view of the realpolitik in that perpetually challenging region of the world. They have to be clear-eyed, of course, because their very survival is on the line. It’s fair to say the Israelis aren’t happy about this agreement, and neither are their supporters — both Republican and Democrat — in the U.S. Congress. In fact, Israeli Prime Minister Benjamin Netanyahu called it a “historic mistake.” The Israelis and their supporters think the sanctions were working and should have been continued until Iran agreed to end its program. I don’t trust Iran. I don’t trust a government that has called for the obliteration of Israel, that still has a scent of fanaticism about it, that has cracked down on its own citizens as they have tried to exercise basic freedoms, and that has been a fomenter of terrorism and unrest in the Middle East for decades. How do you negotiate with a country that you can’t trust? Thank goodness the Secretary of State provided the world with such assurance! Of course, it would have been more effective if he also had made it clear that the United States is not demented, deaf, morally bankrupt, hopelessly naive, or emotionally exhausted, either. Weird that the Secretary of State would portray the American approach to the negotiations in such a defensive way, isn’t it? Has our standing in the world reached such a point that we actually need to address international concerns that our most senior diplomats are being hoodwinked by the likes of the Iranians? I don’t think America is blind or stupid, either. I’m hoping that, as the talks with the Iranians proceed, our government is carefully coordinating with the Israelis and approaching Iranian promises with appropriate skepticism. What does it say, though, that our allies apparently concerned about the quality and experience of our leaders that the American Secretary of State would feel impelled to say such a thing?